Hatfield based bus company, Uno Buses, commemorated the inspirational women of the Air Transport Auxiliary at the launch of its new bus brand tigermoth on Monday 4 February 2019. Each of the eight buses, branded tigermoth after the de Havilland biplanes manufactured at Hatfield aerodrome, will commemorate one of the first eight women who joined the Air Transport Auxiliary (ATA) in 1940. The ladies broke into the all-male world of military flying, something that is now cited as an important chapter in both aviation and women's history. The ATA was a civilian organisation which ferried planes between factories and front-line RAF airfields during World War II. These first female members of the ATA flew the first delivery of Tiger Moth ‘open cockpit’ planes from Hatfield up to Scotland in the depths of winter in World War II. The 8 tigermoth buses will run on Uno’s 653 service between Hatfield, Welwyn Garden City and St Albans. 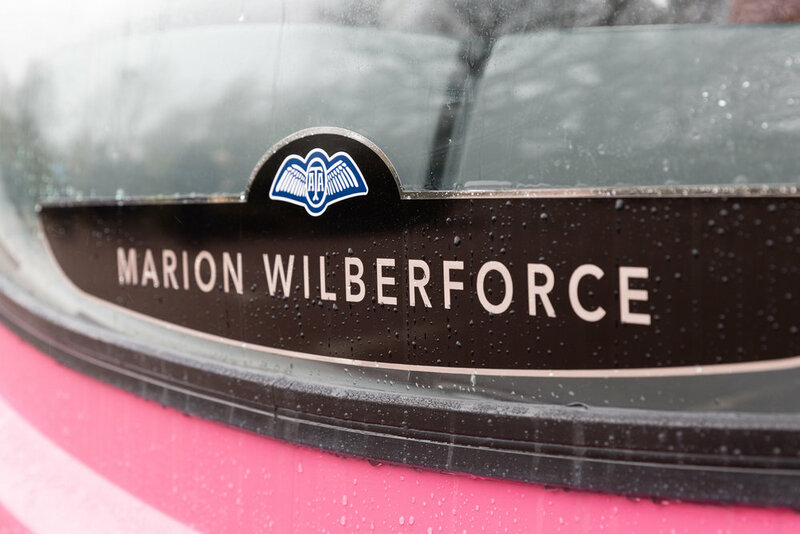 Each bus will have the name of one of the ladies on the front of the vehicle and inside the bus there will be a photo and further information about her life and the ATA. The eight women joined the ATA on New Year’s Day 1940, recruited by Pauline Gower. Initially, they were restricted to flying non-operational types of plane, such as trainers or communications aircraft. They were also paid 20% less than the men, which was typical of the times. The female pilots became known as the “ATA-girls”. Pauline Gower eventually won equal flying opportunities for the women. On 19 July 1941, Winnie Crossley was the first woman to be checked out on a Hurricane fighter. In autumn 1942, First Officer Lettice Curtis became the first woman to fly a 4-engined bomber, an achievement shared by just 11 ATA women. Finally in 1943, the women were awarded equal pay to their male colleagues, making ATA one of the first equal opportunities employers. John Lumsden, Treasurer of the ATA Association and nephew of Marion Wilberforce, attended the launch on Monday along with Graham Rose, Chairman of the ATA Association, son of Molly Rose, a member of the ATA who delivered 486 aircraft during World War II. During the war, over 1250 men and women from 25 countries ferried a total of 309,000 aircraft of 147 different types. In total, 173 ATA aircrew died in ATA service, including Amy Johnson. The first eight women were true pioneers and an inspiration to a new generation of women and girls in the male-dominated aviation field. In the UK, less than 5% of airline pilots are women. Last year, when UK companies reported their gender pay gap data, British airlines were shown to have large gender pay gaps with the largest being Ryanair at 71.8%. The difference is largely driven by the gender imbalance in the aviation pilot workforce. Easyjet, which reported a 45.5% gender pay gap, is one of the airlines taking positive action to attract more female pilots. In 2015, EasyJet launched the Amy Johnson Flying Initiative in a drive to double the number of female new entrant pilots to 12 per cent over two years. Having reached that target in 2016, the airline set a more ambitious target of 20 per cent by 2020. “It’s hugely encouraging to now see that of the new entrant pilots we have attracted over the past year that 15% are now female and that the ambitious goal of 20% is in our sights and we don’t plan to stop there! We continue to work hard to encourage more women to join this hugely rewarding profession and from a starting point of 6% in 2015 to 15% this year is a real achievement. Johan Lundgren was appointed as chief executive of Easyjet in December 2017 and voluntarily took a five per cent pay cut to match his salary to his female predecessor Carolyn McCall. Our thanks to Chloe Leach-O’Connell for sharing the incredible story from Uno and the ATA. If you have an inspirational story about women in transport that you would like us to share, please contact us at info@womenintransport.com. Follow us @transportwm or on Linkedin Women in Transport for events, news and updates.